So there I was, going for a walk through Dublin in the middle of the night, like you do. I was so focused on the gorgeous ship that I was headed toward that when I bumped into “someone” I apologized. Turns out I was apologizing to the 2nd creepiest set of statues/sculpture that I have ever seen…and I was in the middle of it. 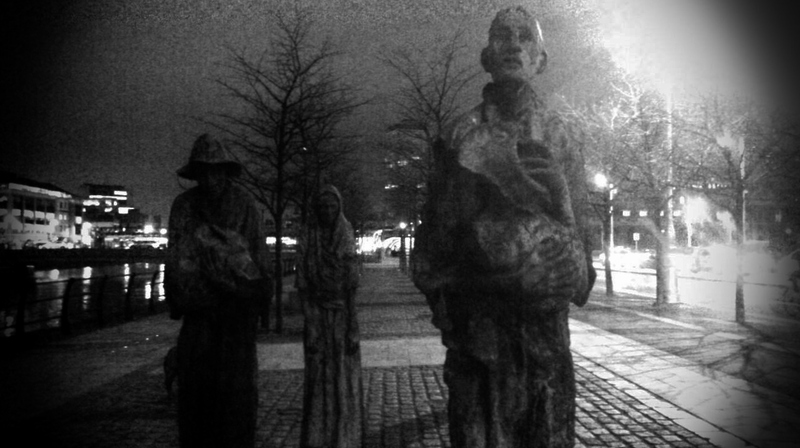 Ireland is a mecca for memorials, historical places and public sculpture, but few are as somber, creepy and potent as the Famine Monument on the bank of the River Liffey in Dublin. The Famine Memorial sculpture was created by Rowan Gillespie and unveiled in 1997. The sculptures consist of emaciated men and women trudging along the banks of the river, with various expressions of sadness, despair and determination. To really drive the point home, the bronze sculptures also include a starving dog walking behind the people. They are one of the most photographed public art pieces in all of Ireland and to stumble across them after midnight on a long night in December was disconcerting to say the least. This sculpture is a permanent memorial to the many people who emigrated because of Ireland’s Great Famine. It’s built on the departure site of the Perseverance, one of the first famine ships to leave the area in 1846. The ship’s captain was a 74 year old man who quit his office job to transport the starving people from Dublin to America. All passengers arrived safely and the Perseverance was one of the first of thousands of ships to make that epic crossing. Statistics estimate that even today there are more Irish people living outside of Ireland than within its borders, and this haunting piece is a stark reminder of when that emigration began and why. 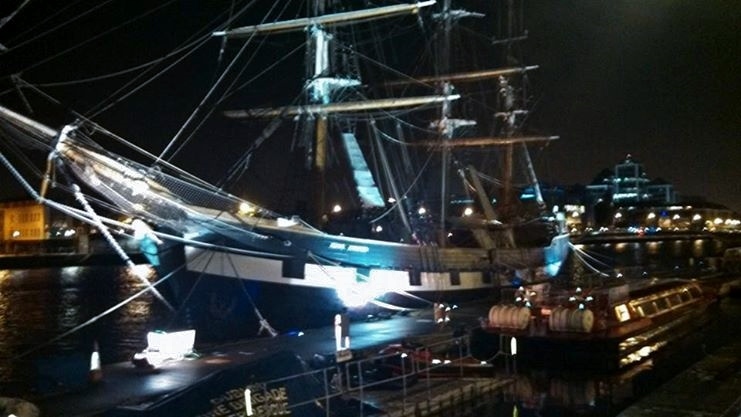 Just a few steps away from the sculpture is a tall ship moored in the water that is set up as a famine museum. The Jeanie Johnston is a replica famine boat and is a fitting backdrop for the memorial statues. They are gorgeous, haunting and creepy and if you have a chance to visit them, do so.